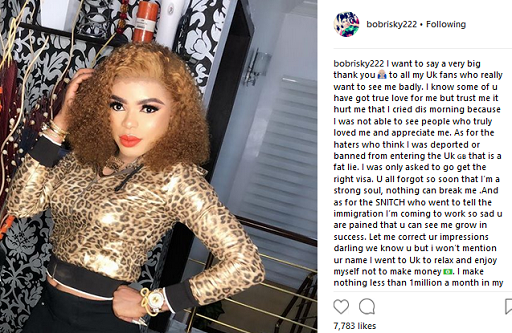 Bobrisky was supposed to be in UK yesterday for a Meet & Greet with fans ahead of his birthday celebration in London, however, he was denied entry at the Heathrow airport. According to the cross-dresser, someone snitched on HIM. Someone alerted the authorities Bob was coming to work with a visiting Visa, and also showed them evidence. They were waiting for Bob when he arrived he was excused off the line and questioned. Bob couldn’t defend it and so he was denied entry into the country and was forced to return back to Nigeria. He arrived Lagos early hours of this morning and people have been mocking him on social media. He has now been forced to address the report saying his haters are behind it, and he will be back to London soon with the right visa. What he said.